This algorithm derives the concentration of particulate inorganic carbon (PIC) in mol m-3, calculated using observed in situ relationships between water-leaving radiances, spectral backscattering coefficients, and concentrations of PIC (i.e., calcium carbonate or calcite). Algorithm implementation is contingent on the availability of sensor bands near 443 and 555nm. 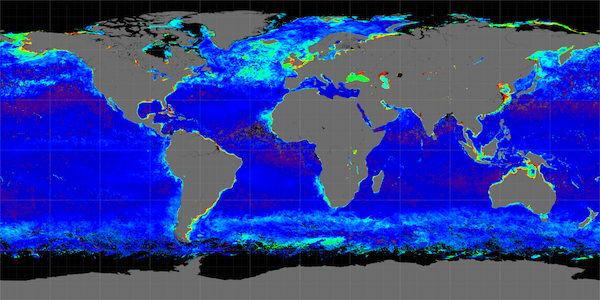 The algorithm is applicable to all current ocean color sensors. The PIC product is included as part of the standard Level-2 OC product suite and the Level-3 PIC product suite. The PIC algorithm is a hybrid of two independent approaches, defined here as the 2-band approach (Balch et al. 2005) and the 3-band approach (Gordon et al. 2001). The 3-band approach is used when the 2-band approach fails. Normalized water-leaving radiances in two bands near 443 and 555 nm. The algorithm makes use of a precomputed look-up table, derived from in situ measurements, that contains the total backscattering coefficient for calcite at 546 nm, bbc(546) in m-1, as a function of nLw(443) and nLw (555). The concentration of calcite (PIC) is computed by dividing bbc(546) by a calcite-specific backscattering coefficient (1.628 m2 mol-1), as also derived from in situ measurements. In cases where nLw(555) is not available (OCTS, MODIS, MERIS, etc. ), it is estimated from the closest native green wavelength (547, 560, and 565 nm, etc.) using the empirical relationships described here. The 2-band algorithm may fail to retrieve PIC for two primary reasons: 1) the normalized water-leaving radiances could not be retrieved due to atmospheric correction failures or other masking conditions (e.g., clouds or land), and 2) the retrieved water-leaving radiances may be outside the range of values in the precomputed LUT. A common reason for either of these conditions is that the PIC concentration is very high, which can result in large water-leaving radiance signals in the near infrared channels that lead to poor or failed atmospheric correction. In some cases the signal is so strong in the near infrared that the observation is flagged and masked as a cloud. When these failures occur, the algorithm will attempt a retrieval using the 3-band approach, which uses a simple atmospheric correction that is more robust over bright waters. ρt(λ) is top-of-atmosphere reflectance (measured), ρr(λ) is reflectance due to Rayleigh scattering in the absence of aerosols (calculated), ρf(λ) is reflectance due to whitecaps and foam (calculated), ts(λ) is diffuse transmittance of the atmosphere from surface to sensor (calculated), tg(λ) is atmospheric gas transmittance Sun to surface to sensor (calculated), ρw(λ) is water-leaving reflectance (unknown), and ρa(λ) is aerosol reflectance (unknown). Through an iterative procedure, seeded by setting the backscattering coefficients to their pure seawater values, values for ρa(865) and a can be retrieved, and ultimately the backscattering coefficient for calcite at 546 nm, bbc(546) can be derived. The concentration of calcite (PIC) is then computed by dividing bbc(546) by an a priori calcite-specific backscattering coefficient (1.628 m2 mol-1). As noted, the 2-band algorithm uses a common look-up table define for nLw(443) and nLw(555), and adjusts the satellite nLw retrievals as needed to account for sensor-specific differences in center wavelength relative to the look-up table indices. For the 3-band approach, the atmospheric properties and water optical properties are computed at the sensor specific band passes in the red and near-infrared, and thus the sensor differences are inherent in the implementation. The actual wavelengths used for the various sensors are shown in the table below, with the 3-band algorithm center wavelengths in parentheses. The PIC product is not computed if the Level-2 flags indicate LAND, HIGLINT or CLOUDS. A failure condition is indicated in Level-2 by setting the PIC value for that pixel to the _FILLVALUE and setting the Level-2 flags to indicate PRODFAIL. For further details go to the algorithm source code or the dependency graph of the algorithm implementation in the NASA ocean color processing code (l2gen). A limited set of Level-2 satellite-to-in-situ match-up validation results are available for each sensor from the validation tool of the SeaWiFS Bio-Optical Archive and Storage System (SeaBASS). Links to those match-ups are provided below.